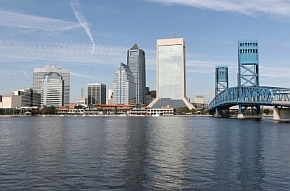 Jacksonville, a county seat, is the largest city in the state of Florida, both in terms of population and sprawl. And speaking of sprawl, Jacksonville is the largest city by area in the entire U.S.
Nicknamed JAX, Jacksonville is home to two significant military bases--Naval Air Station and Naval Station Mayport. It is no surprise that the military is the largest employer, contributing about $6.1 billion to the economy annually. Jacksonville holds the distinction as the third largest port in Florida, generating 50,000 jobs in Northeast Florida. With 2.8 million visitors a year, tourism is a major driver for the local economy, as well. contributing about $1.6 billion and supporting 10% of the workforce. With a diverse number of industries and a growing economy (four Fortune 500 companies are headquartered in Jacksonville), job opportunities remain strong. Additional information on the local economy and key employers... Wikipedia: Jacksonville Economy.